With the morning rush we always prefer to have some dish which can be cooked faster and at the same healthier. 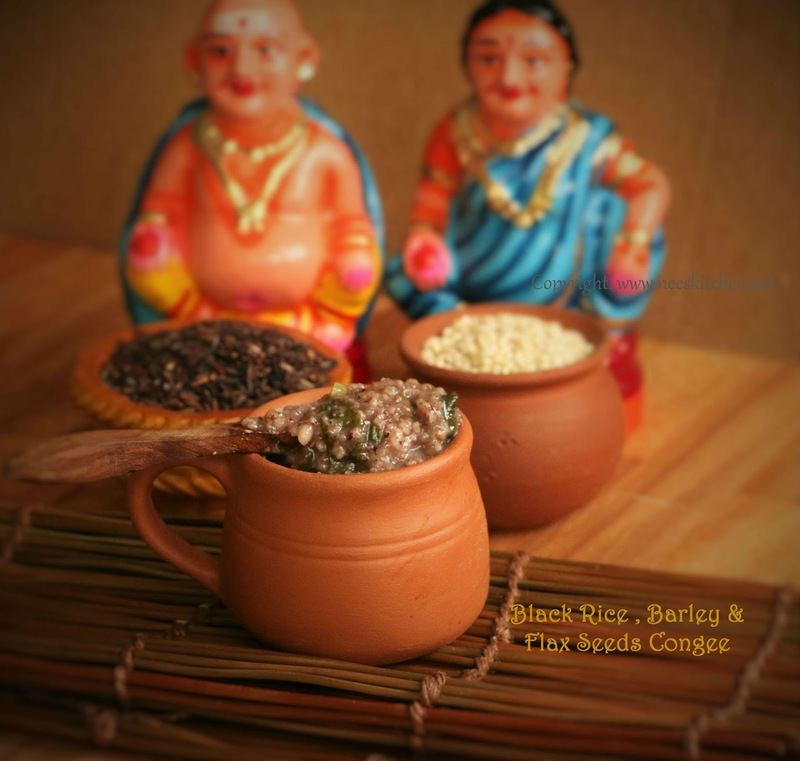 Cooking Black rice consumes a lot of time as we need to soak them for a minimum of 8 – 10 hrs. However, Black rice congee is one recipe which can be cooked very fast if the congee powder is prepared in advance. This soup or congee is a combination of black rice, barley, flax seeds roasted and powdered coarsely and cooked along with tossed garlic & spinach. Black rice or forbidden rice contains the lowest number of calories among other rice varieties but has a high amount of nutrients. Barley on the other hand is good for intestine.Flax seeds is high in omega3. Combining all these 3 together into a single dish is beneficial for all age groups. 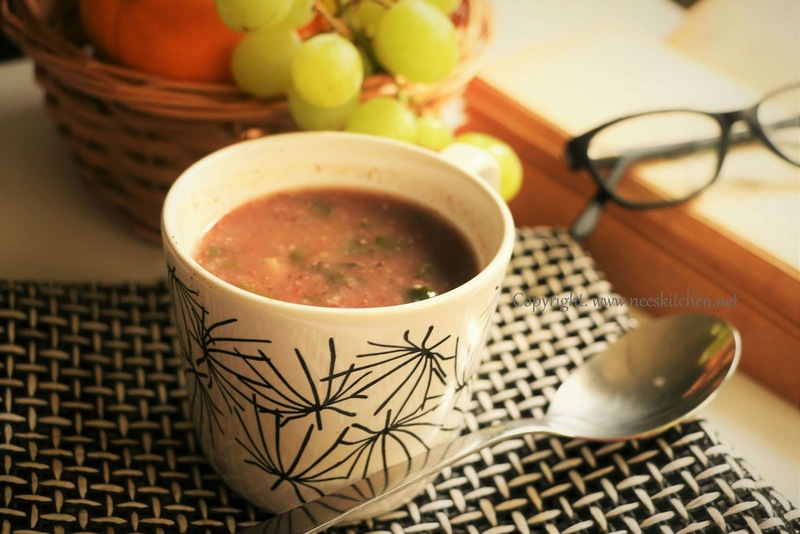 We generally take this soup at least weekly twice as morning breakfast or during dinner. The soup is light and filling for a long time. I have used soap stone vessel (Maakal) as it preserves the nutrients and hence the timings would vary when you use a normal vessel to cook. This powder can be preserved for a month. They are very responsive to the messages. 1. Dry roast in the following order starting with barley , black rice and flax seeds. A nice aroma comes after each one of them is roasted. 3. Grind them into a coarse powder and store them in an air tight container. 4. Take a heavy bottom vessel and add oil. 5. Add garlic and let is cook for a minute. 6. Add Spinach and let it cook completely. 7. Once the spinach is cooked add water, salt and let it boil completely. 8. Add congee powder and rasam powder and stir it until both the powders are mixed nicely. 9. Let it cook until the soup is thickened. Black rice , barley and flax seeds congee is ready. The quantity of powder mentioned comes for around 20 times approximately for the mug congee preparation. You may which to increase/decrease the quantity of congee but the proportion should not be changed as it would alter the taste. You may add pepper or increase the rasam powder quantity if you want the dish to be a bit spicy. The quantity mentioned above is not a spicy one as we do not prefer to eat very spicy in the morning. I used red spinach which is available easily in our grocery shops, you may use amaranth leaves or palak also. I used the Thai based black rice , however all black rice more or less takes same time for cooking. Brown rice can be replaced with black rice if you are unable to find black rice.